We have been discussing the powerful and essential ecological link between apex predators, their prey, and the foods prey eat. Based on the revolutionary ideas of Hairston, Smith, and Slobodkin, who in 1960 ingeniously proposed that the world is green because predators limit their plant-eating prey, trophic cascades science has since then explored the consequences of predator removal from ecosystems worldwide. In all ecosystems, researchers have found a strong link between predator removal, plant community simplification, and reduced energy flow. Lacking apex predators, ecosystems become capable of supporting fewer species, because the trees and shrubs that create habitat for these species have been over-browsed. With top predators in them, they contain richer and more diverse habitat, and thus can support a greater number of species such as songbirds and butterflies. Apex predators are thus thought to exert top-down effects on ecosystems. A picture is worth a thousand words. The pictures below illustrate the effects of predation—and predator removal. For example, in Alaska Jim Estes and his colleagues have found that removing the sea otter, the apex predator in the Aleutian archipelago, causes sea urchins to increase in number to the point that they greatly reduce kelp forests. Kelp forests provide habitat for many other species, such as fish. Returning sea otters to the ocean helps reduce sea urchin numbers, and in turn enables kelp to thrive. In Venezuela, John Terborgh found that on islands too small to support large predators, such as jaguars and eagles, leaf-cutter ants eventually denuded the forest floor, greatly diminishing habitat for songbirds and other species. In my own research in Glacier National Park, Montana, I have found that since wolves have returned, aspen formerly browsed to death are now growing above the reach of hungry elk. The gap in aspen linked to wolf removal and their subsequent return, called a recruitment gap, is one of the trophic cascades patterns written on the landscape I study in the Northern Rocky Mountains. Where else might these effects be manifested? And in places where apex predators might not be tolerated, how can managers create healthier ecosystems? Other effects, besides predation, also make energy flow through ecosystems and enable vegetation thrive. Some of these effects, which can be caused by environmental factors such as moisture and sunlight, are termed bottom-up effects. How might climate change, a bottom-up effect, contribute to apex predator effects, a top-down effect? Climate change will have a negative contribution, in toto, to predator effects. The Pacific Northwest has had a very cool spring and summer, with unusual snow pack remaining. Animals that would normally move to higher elevations may stay lower, affecting both flora and fauna at all elevations. Territorial predators such as Puma concolor will follow (or stay with prey) at lower elevations, perhaps competing with wolves who may not hunt as effectively as cougar in the higher areas (leaving the high ground to lions), thus setting up an artificial competition for resources. Plant cycles are disturbed, and plants may bloom before or after pollinators emerge (also suffering disrupted cycles). Stream temperatures are wrong, and may adversely affect the cycles of fish and other water-dwellers, further complicating the web interactions. I cannot envision any positive contributions from rapid climate change, because the system is too complex for us to understand all ramifications of change, and any 'positive' effect on one species will impact many others. For example, look at the imbalance the positive effect of agriculture on Homo sapiens has had on, say, wolves, grizzlies, and cougars. The most important part of any system is the part that fails. Redundancy may exist, but there will be a load shift, and that may lead to a cascade of effects—oh wait, that’s what brought me to Island Press in the first place. Trophic cascades seem to provide a strong framework for understanding state changes. Keystone predators, because of trophic cascades effects, help increase biodiversity. This makes a system more resilient to climate change. As the climate changes, and habitat shifts for many species, a more resilient system is one better able to continue to function in the way it typically has. Having keystone predators in an ecosystem enables its plants and animals to better withstand the weather that comes with climate change (floods, fires, severe storms in late spring) that we have been seeing so much of in recent years. I am really enjoying these blog posts. I have learned a lot of new information both from the book and this conversation. Thanks!!! Thank you, Ted. 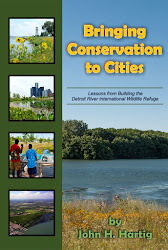 I am interest in learning how readers like you think trophic cascades ideas could be applied in landscapes where you live--which includes urban and suburban areas.